Page 4: SNCF and Amtrak operation, an example Table of Contents Page 6: Why are Amtrak trains so slow? 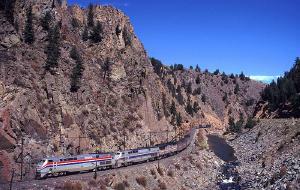 The example on the last page has compared a French standard train with a tilting train in the USA. 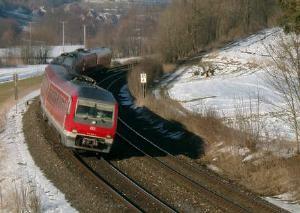 A possible conclusion could be, that not every tilting train uses its technical potential. 1 Other increments than 1 mph are ignored for speed restrictions. The reason is explained here. The allowed unbalanced superelevation for standard passenger trains is 3 inches in the USA, while some tilting trains in Spain, Britain, Finland and Germany got allowance for 11.8 inches. While WSDOTs Talgos help to speed up Amtrak quite obviously, the result falls short of the technical possibilities. 3 inches of unbalanced superelevation is the US standard, but the FRA allows 4 inches by waiver in some cases. The operational reality is even more extreme, because expecting the same superelevation is not realistic. On a freight route in the USA, 3 inches will be exceeded quite seldom. On mixed-usage track in Europe, the legal limit might not be used normally, but 5 inches of superelevation for the tightest curves is a realistic assumption. The type 610 DMU operates with up to 11.8 inches of unbalanced superelevation, allowed by waiver of the Eisenbahnbundesamt, a German authority similar to the FRA. So a curve with this radius might restrict a train to either 39 mph or 65 mph in everyday operation. This might be enough evidence to assume, that "the track is curvy" is no sufficient explanation for the low speed of Amtrak trains. And it might discourage the direct comparison of possible upgrade results in Europe, Japan and the USA. Instead, a more detailed approach is unavoidable.